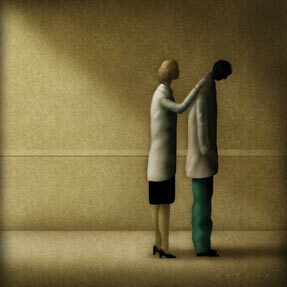 Depression can be prevalent during medical residency, with long hours and social deprivation as contributing factors. Concerningly, the farther residents are into their training, the more depression rates rise. Some programs are delving into their trainees' psychological well-being. To control symptoms of rheumatoid arthritis, new guidelines are encouraging internists to act sooner and more definitively combatting the course of the disease. Also, disease-modifying anti-rheumatic drugs are playing a bigger role in controlling symptoms. Twenty years of the Health Insurance Portability and Accountability Act have not led physicians to full understanding of how to implement it in their offices. Four commons myths can be addressed more easily than is commonly thought. Despite convincing results for many health care interventions, translating evidence from research into clinical practice is often challenging. What works in a research environment may not function in practice. Readers respond to previous coverage about mergers of large insurance companies, and with concerns about our coverage of complementary care. A 75-year-old woman is evaluated in the hospital 4 hours after onset of chest pain with findings of an ST-elevation myocardial infarction. She was taken emergently to the catheterization laboratory and underwent emergency percutaneous coronary intervention for a totally occluded vessel. Her post-intervention ventriculogram demonstrated a left ventricular ejection fraction of 30%. One hour after the procedure, she developed an acute arrhythmia. Medications are aspirin, metoprolol, atorvastatin, and clopidogrel. Following a physical exam, cardiac exam and electrocardiogram, what is the most appropriate management?.